When it comes to Halloween things I usually choose cute over gross or scary so I'm not really sure how these cookies came about. I saw cupcake sets like these in stores and was inspired to cookie-fy them. By the time I finished with the details they were looking really icky but I'm loving them! The taste is great too once you work up the nerve to eat the squishy fondant brain. 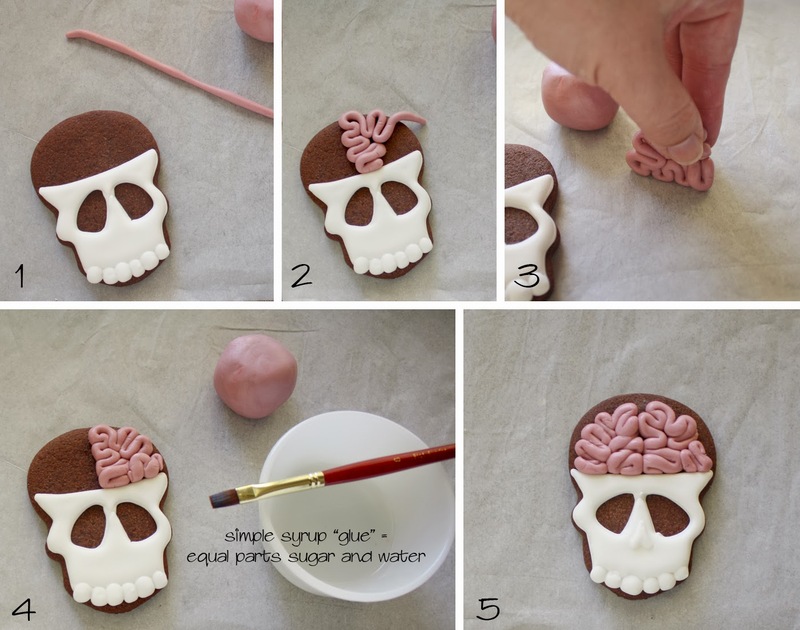 Start by outlining the skull and eye sockets in white piping icing. Wait a minute or two for the first teeth to crust over and then add the rest of the teeth. Ordinarily I might worry about icing craters forming in the teeth but this is one time when they can really boost the design so don't stress them! Allow the outlines and teeth to dry for a few minutes and then fill in the skull with white flood icing. Let the skulls dry for several hours. Loop the fondant rope back and forth to make the brain. I found it looked more "brainy" if I started at the center and then zig-zagged my way up to the top of the skull and then back down. If the rope gets too thin or is too short tuck in the end piece and start a new rope. The fondant won't stick to the cookie until you "glue" it in place so you can play with the shape if you need to. Once you have the fondant shaped like you want gently flatten one side to be the brain's mid line. 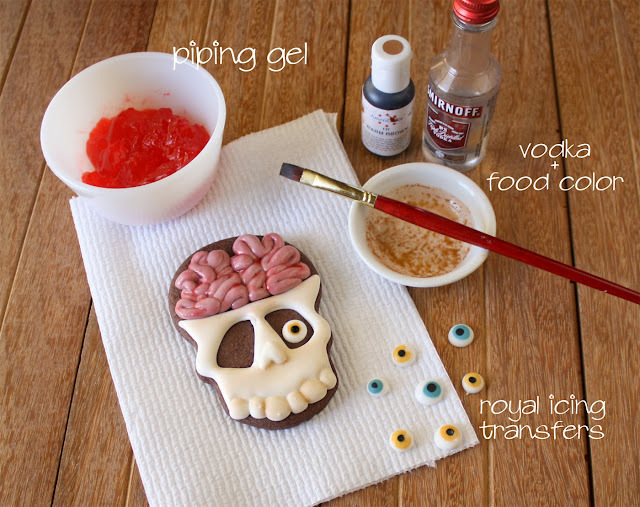 Repeat steps 1-4 to make the other side of the brain and pipe the nasal bone in white icing. Now you could be done at that point but to really increase the "ick" factor brush some red piping gel on the fondant brain to give it a slimy look. I used this recipe for the piping gel but I replaced the lemon juice with water because I guess I had to draw the line at brains with lemony zest. I also used a little brown food coloring and vodka to bring out the texture of the teeth and give an aged look to the skull. 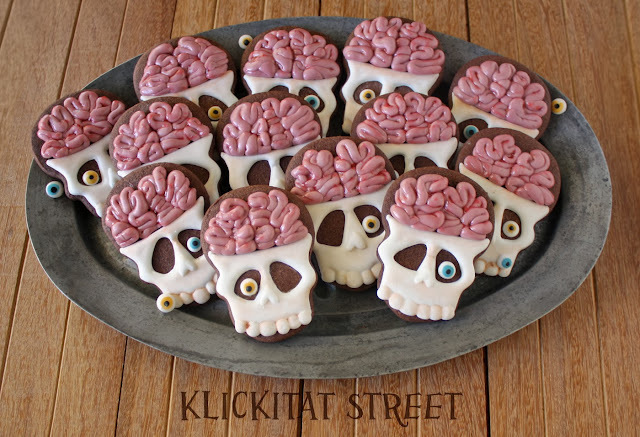 Royal icing transfer eyes give the skulls some character and a little cuteness. All of these details are optional but I think they really up the wow factor of the cookies! Okay, so seeing them all together they are pretty gross looking but they are fun and tasty and isn't that the point of Halloween anyway? These look incredibly real! I was wondering if that was icing or fondant, Great thinking! So creepy....yet so cool! They look amazingly real...wish I had some "adults" to make these for, a little too scary for young ones I think, lol! Awesome job! You...are.. brilliant! These are absolutely fantastic! You are just something. Incredible. Can I just be you???? Your cookies are amazing. You really are talented. These are really, REALLY creative!!! I looooove these!! 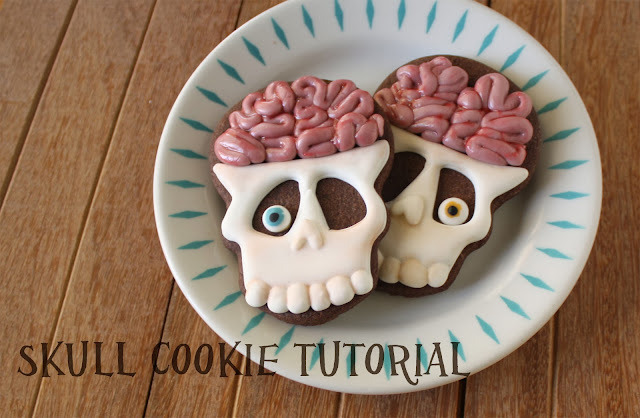 I wish I was better at cookie decorating so I could make one of these as a zombie with brains coming out of a bitten skull! I'll get better and file this away for when I can actually execute my vision. I'm totally into gore so these were "cute" on my gross-o-meter. Sarah. Oh, Sarah! How do you do this! I love your posts and these scary cookies are beyond clever! Thank you for sharing your amazing art!